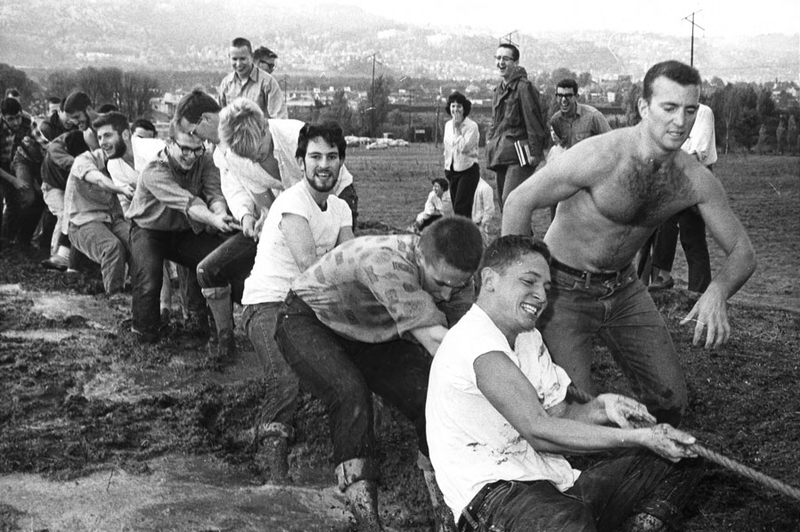 Burly sophomores dig deep in tug-of-war against puny freshmen on Campus Day, 1961. Education is not simply the process of acquiring information. It's also about detecting disinformation. If you buy into this idea, it follows that the solution to most of our problems is education. Intelligence, equipped with the latest information, will prove irresistible. It’s an appealing philosophy. But my faith in this commonsense ideal has taken a few knocks lately. We live in an era of mist and shadow, of fake news and “alternative facts.” Conspiracy theories that were once the domain of lunatics flourish on the internet like mushrooms in a woodpile. I no longer believe that society can solve this problem simply by ladling information into students and sending them into the media landscape we inhabit today. Their innocent certitude will crumble at the first encounter with the partisan fanatics who insist that the MMR vaccine is linked to autism and that global warming is a liberal fiction. No. A stockpile of facts is not enough. We need people who know how to sort through competing claims, interrogate the authority of sources, weigh the evidence, and reach their own conclusions. People who are willing to go to unfamiliar places and absorb new perspectives. People with the guts to revise their ideas based on new research. People who still believe in a concept that is beginning to sound old-fashioned—the truth. In short, we need more Reedies. Because sometimes the enemy of knowledge is not ignorance, but something more sinister.